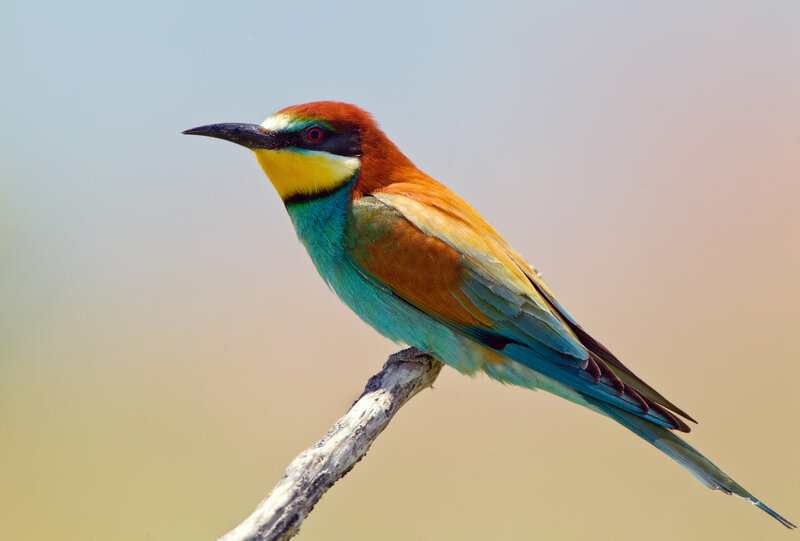 The European Bee-eater (Merops apiaster) is a near passerine bird in the bee-eater family Meropidae. It breeds in southern Europe and in parts of north Africa and western Asia. It is strongly migratory, wintering in tropical Africa, India and Sri Lanka. This species occurs as a spring overshoot north of its range, with occasional breeding in northwest Europe. This is a bird which breeds in open country in warmer climates. Just as the name suggests, bee-eaters predominantly eat insects, especially bees, wasps and hornets which are caught in the air by sorties from an open perch. Before eating its meal, a European Bee-eater removes the sting by repeatedly hitting the insect on a hard surface. It eats some 250 bees daily. Lizards and frogs are also taken. The most important prey item in their diet are Hymenoptera, mostly Apis mellifera; a study in Spain found that these comprise 69.4% to 82% of the European bee-eaters’ diet. Their impact on bee populations however is small; they eat less than 1% of the worker bees in the area in which they live.